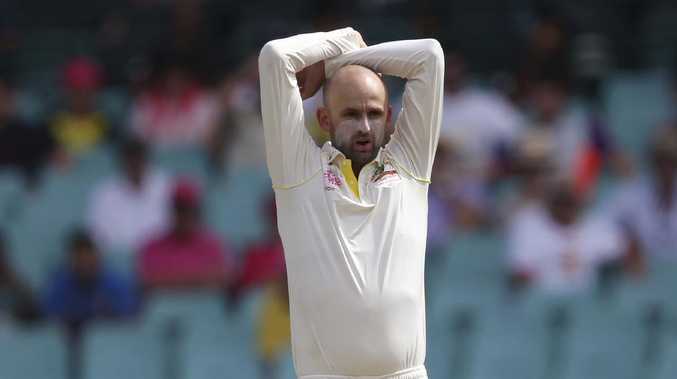 NATHAN Lyon is fed up - and in an interview that will rival Cameron Bancroft's as the most explosive of the summer let his teammates have both barrels. 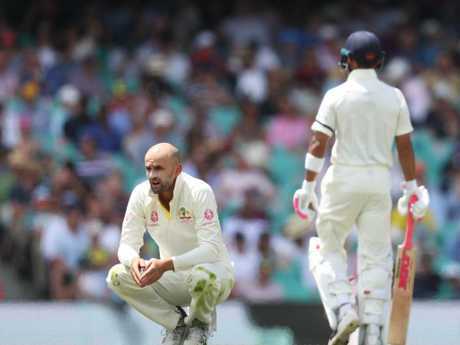 The off-spinner was notably testy after Cheteshwar Pujara and India punished the local attack on day one at the SCG, posting 4-303 in a start that had former English captain Michael Vaughan declaring the series was already won. Lyon initially tried trotting the party line when he spoke to ABC radio, saying: "Pretty disappointing day to be honest. The bowlers, we weren't at our best, and full credit goes to Pujara, he's been outstanding the whole series and it's continued today." But it quickly became apparent he was in no mood to be positive. Asked about the change in tactics after the drinks break in the first session - where Australia changed from line and length bowling to a short-pitched approach - Lyon voiced his frustration. "I wasn't too happy about it, to be honest," he said. "We missed out on using the moisture in the wicket. We could have stuck there longer. But the captain and the bowlers came up with a decent plan and unfortunately it didn't work." Josh Hazlewood finished with the solid figures of 2-51 from his 20 overs but Mitchell Starc (1-75 from 18), Pat Cummins (0-62 from 19) and Lyon (1-88 from 29) battled largely in vain. The off-spinner also appeared bemused at the lack of overs given to leg-spinner Marnus Labuschagne, who finished with 0-25 from four. "You're going to have to ask Tim Paine that. I've got no answer for you," Lyon said when asked if he expected the recalled Queenslander to bowl more. "Obviously Marnus didn't bowl the best I've ever seen him bowl, but he's a young leg-spinner and a very talented batter and he's got my full support. He's an up-and-coming cricketer and he's got a lot of Test cricket to play for Australia." Lyon also took a shot at the attack's failure to build pressure against Pujara, who finished 130 not out in his third ton of the series. "It goes back to basics - and you have to do basics for longer periods," he said. "That goes back to patience and discipline for us bowlers and unfortunately we didn't have either of those greatly today." Former Aussie quick Dirk Nannes, who took part in the interview, was surprised by how candid Lyon had been. "I've never actually heard him be that scathing on his teammates. That's the first time I've heard him break ranks and actually criticise something they've done or the way they've gone about it," Nannes said. But Nannes agreed the short-pitched approach had been baffling. "I was shaking my head a lot today during those periods when Australia went to the short stuff. It seemed to be almost thoughtless in the way they went to it," he said. "You've got a day one pitch - yes maybe the ball hasn't been swinging around or nipping around as much as you'd like - but the fact remains it's a day one pitch, you're in the first session, you've been sent to bowl and the only way you're going to get a positive out of it is to take early wickets. "To come out and go so obviously towards the short stuff, it just had me scratching my head. Surely the play there is to just keep trying to hit the top of the stumps - do exactly what you would have done in every other first-class game you've ever played before in your life ... and bring your grippers in to play." Lyon and Nannes' view flew in the face of the criticism levelled against the Aussie pace trio in the first 12 overs of the day. In commentary for Channel 7, Ricky Ponting argued the hosts were playing in to India's hands by opting not to test them with chin music. "They have all bowled a bit too much the same ...," Ponting said. "What are we, eight overs in and we've only seen a few short ones? Why do we always talk about wanting to play India in Brisbane and Perth when they come to Australia? Because they don't like the short ball. They don't like the pace and bounce. We've only seen one short ball all morning." "They are forgetting to intimidate the batsmen," added Michael Slater. "You don't want to get them up around your throat. Then that full ball can become more effective as Ricky was saying." Fast bowling legend Glenn McGrath agreed. "When Australia bowled short balls (in the second innings in Melbourne) they looked good," he said. "I would like to see them become more aggressive." 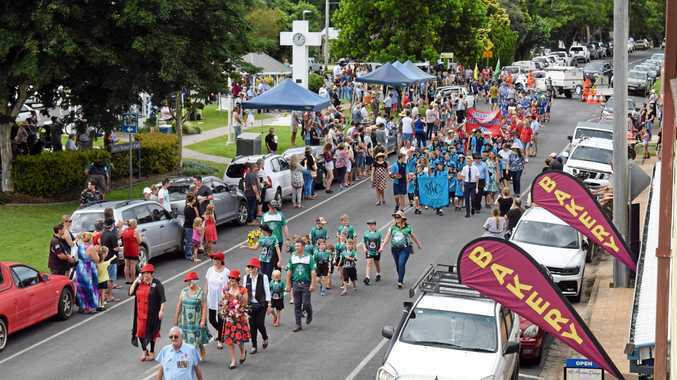 The contrasting opinions rammed home veteran cricket journalist Robert Craddock's claims it was the bleakest day of the summer. "It was almost the day Australian cricket lost its aura - and that's a big statement," he said on Cricket 360. "We're used to touring teams coming here and being nervous about Australia. This team (India) is as fearless as any we've seen here for many years. You can hit them on the head, you can hit them on the body and they just keep going. "Pujara has set the example but the others are so nerveless Australia is getting no wickets through the force of their reputation. If it's a bad ball, they get spanked. And I just think it's the new India - they're fearless."